For sites, most pumpers prefer the abdomen, but anywhere that has padding will do. The abdomen usually gives the fastest and most consistent absorption. You should stay at least 2 finger widths away from the navel for good absorption, and above or below the belt line. The upper buttocks, thighs and back of the upper arms also can be used. The buttock area often works best for young children because it is a large skin area that is out of sight. An area you can easily see is best when first starting on a pump or if you are having site issues. A patch pump can be placed in many of the same locations but stay away from skin folds where the pump may get detached if you bend over or twist sideways. Change the infusion set and site every 2 to 4 days, at least 4 hours before bed, and at least 24 hours before your glucose typically rises if you have set problems. You want to prevent infection, damage to the skin, scarring below the skin, and fat buildup from excessive use of one area, called lipohypertrophy. Rotate areas, such as right upper quandrant of the adbomen to right lower to left lower to left upper. Sites may also be rotated in small steps, such as moving each new site about 2 inches from the last one. To remember to change your infusion site, put just enough insulin in the reservior to last until the next site change. Most pumps have reminders that you can set to alert when it is time to change, as well. 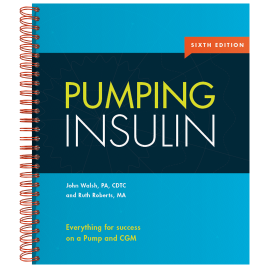 Insulin injections very rarely cause infections, but pump infusion set sites or patch pumps are more prone to infection because they stay in place for 3 days or so. Bacteria can be present on the hands, breath, skin, counter tops, clothing, and everything you touch. If you have had even a small skin infection in the past or a history of inflammation and redness around cuts or wounds to the skin, you are likely to carry on your skin a dangerous bacteria called staph aureus, the most common culprit in site infections. Over 20% of people carry staph on their body at all times and another 25% intermittently carry it. People with diabetes are more likely to be carriers. Staph carriers are more likely to get site infections. Staph bacteria are usually present in the nasal cavity and on the skin, especially in the armpits and between the legs or buttocks. Carriers can often decontaminate themselves by treating the inside of the nose with a triple antibiotic cream on a Q-tip and cleansing the skin with an antiseptic cleanser like Dial soap about three times in one week. This may have to be repeated once or twice over a few weeks to totally eliminate staph and be at less risk of infection. Any sign of infection from a cut in the skin or at an infusion site suggests that staph has returned. If this happens, repeat the decontamination process. Infusion site failure is a common cause for unexplained highs. Check your site regularly for irritation, redness, swelling or bleeding. Change the infusion set immediately if you have unexplained high readings or moderate or large ketones. If your glucose is high twice in a row for no obvious reason, give a correction dose by injection and change your infusion set and rotate to a new site right away. Retest your glucose within two hours of changing your set and monitor regularly over the next few hours to ensure that your glucose is coming down. There is no perfect infusion set for everyone. If you experience unexplained highs that seem to disappear after the set is changed, ask to try a different infusion set.